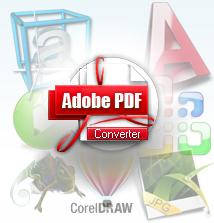 ﻿Adobe PDF Converter - PDF Converter, Word to PDF Converter, AutoCAD to PDF Converter, Excel to PDF Converter, PowerPoint to PDF Converter, CorelDraw to PDF Converter, WordPerfect to PDF Converter, RTF to PDF Converter, Txt to PDF Converter, Image to PDF Converter. Adobe PDF Converter is an All-in-One PDF Converter, You can convert MicroSoft Office Word/Excel/Visio/PowerPoint, AutoCAD, CorelDraw, WordPerfect and more File Formats to PDF Formats. Adobe PDF Converter is an All-in-One PDF Converter, Convert 149 formats. You Can Convert Word, Excel, Visio, AutoCAD, WordPerfect, RTF and more formats to PDF. Adobe PDF Converter can Convert PDF documents from over 140 File Formats. Including Microsoft Word (DOC, DOCX), Microsoft Excel (XLS, XLSX), Microsoft PowerPoint (PPT, PPTX), Microsoft Visio (VSD), Microsoft Works (WDB, WPS, DOCX, XLSX), AutoCAD (DWG, DXF, DWF), CorelDraw (CDR), Corel Presentations (SHW), WordPerfect (WP5, WP6, WPD, WPF), WordStar (WS), DocuWorks (XDW), QuattroPro (WB1, WB2, WQ1), Rich Text Format (RTF), Text Format (Txt), Hyper Text Markup Language (Htm, Html), Windows Bitmap (BMP), JPEG Compressed Image (JPG, JPEG, JP2) etc File Formats to PDF Formats. Adobe PDF Converter is a multilingual software, including English, Chinese, German, French, Italian, Japanese and Very user-friendly interface and easy to use. Very quick in read speed and no quality is lost! 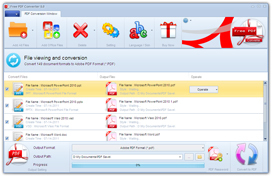 Quickly convert 149 file formats to pdf File Format. Including MicroSoft Word, MicroSoft Excel, MicroSoft Visio, MicroSoft PowerPoint, AutoCAD, CorelDraw, WordPerfect, Adobe PhotoShop, Adobe Acrobat, RTF, Txt, Image and more File Formats to PDF. 1.How to register and obtain the latest version? 2.I am a registered user, how can I get the latest upgrade information? 3.I paid for the registration. Now, 24 hours later, I still haven`t received my registration code. Why? 4.What are the Abdio refund policy? 5.How can I upgrade my Abdio products? 6.Is it necessary to buy the CD?